So, you want to become a Virtual Assistant, but you don't know how to get started? You might not even know what a Virtual Assistant is! 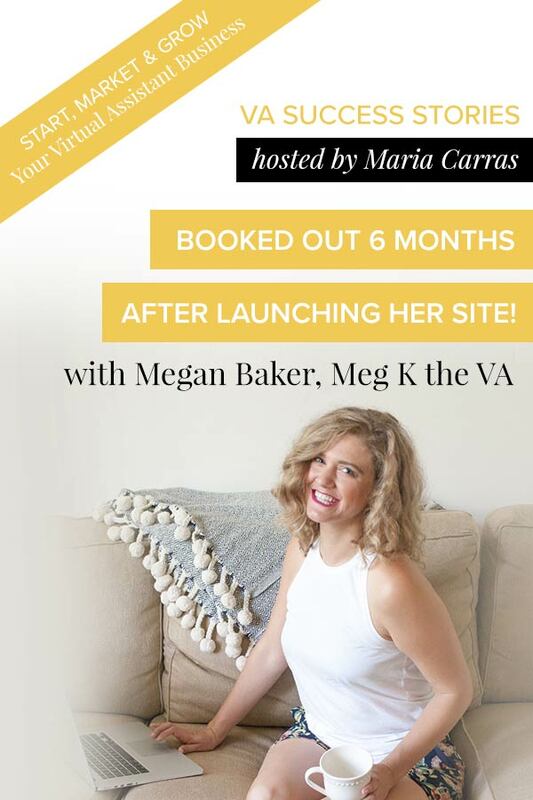 Meet Megan Baker, AKA Meg K the VA. Just six months after launching her website, she was booked out and already ready to hire subcontractors. It was such a joy to chat with Megan and she’s here to talk about her journey and the steps she took, so you can be successful too. In our VA Success Stories series we speak to successful virtual assistants to find out what worked for them and how they got to where they are now. Now living in Chicago, Megan was working as a teacher in St Louis at a French immersion charter school. While she loves working with kids, there was something missing. She wasn’t able to show up in life the way she wanted. Then, an entrepreneur friend told her, you should be a VA! Megan didn’t even know what it meant or would involve, but she decided to look into it. When her husband moved to Chicago, she took the move as her opportunity to jump in head first. "I knew I needed to do it or I was just going to need to get my teaching license in Illinois and go back to teaching!" She spent the spring doing some basic research and when they moved in June, she set up her LLC and had her first client ready. You’ll only be able to find clients if you tell people what you do. But you don't need a website. Megan’s first client was someone she already knew: her dog trainer. When they were having a chat, Megan mentioned she was quitting her job to become a virtual assistant. Her dog trainer’s response? I need someone who could do SEO! Megan’s first contract was for 20 hours of work at $25 an hour. Her advice on sticking to a fair rate? If you charge too low you might end up hating every minute of it. Since she started, Megan has found work through word-of-mouth and her network. She admits she’s actually not 100% sure how clients are finding her now because referrals come from private forums, groups, and face-to-face word of mouth. The Start, Market & Grow Your Virtual Assistant Business Facebook Group is the perfect place to start, as it’s a supportive community of fellow VAs learning as they start and grow. Get validation from people in the trenches with you! Just six months after launching her site, Megan was booked out. When she started, she didn’t have a narrowed list of services. She hadn’t even written up a contract - when her dog trainer asked to work with her, Megan says she “googled how to make a contract” to get started. Megan’s first client needed help with SEO. Was she an expert? “Not really! My first client taught me how to do it!” Whenever you need to pick up a new skill or come across something new, Megan recommends Lynda.com as a fantastic source of information. Even as a teacher herself, Megan invests a lot of time and money in learning new skills. It has helped her increase her prices quickly. Megan’s business is still evolving. Her vision is to create a PR agency - something that she figured out “just last week” when we spoke to her, a decision made clear thanks to her mastermind. Even if you don’t know where you want to go, it doesn’t mean you can’t start. All you need is a computer and wifi connection and you can take over the world. What do people look for when they hire a VA? Our advice to anyone asking the question, “When should I hire someone?” is to hire before you’re ready. Megan is applying this to her own business and was going through the hiring process. So what does a client look for in a virtual assistant? Now that she is hiring herself, Megan realises that personality fit is important. She wants to work with people she can be herself around. Other than the exact skills she needs (so-called “hard skills” you’ll see in job listings like using Photoshop or Outlook) she is also looking for certain qualities or “soft skills”. She wants someone who is a quick study, with long-term goals as a VA that fit her own work. General availability matters too - it doesn’t matter if someone is the perfect fit if they don’t have the time to do the tasks. These are all things you should either look for in a job listing or discuss in an initial consultation with a client. You want your client to be a good fit for you, too. You never know who your first client could be - Megan worked with her dog trainer! Are you ready to start your VA business? Sign up for my free 5-day challenge that will help you launch your VA biz and get your first client in just one week! Enter your details below to get Day 1 in your inbox now!